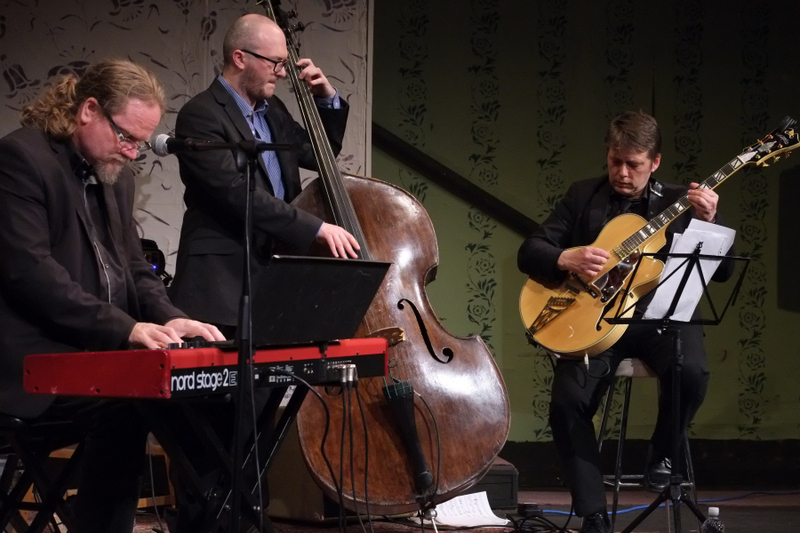 Sunday saw top jazz pianist Craig Milverton return to the Apollo theatre with his Tricotism trio of Nigel Price on guitar and Sandy Suchodolski on bass. Explaining that he ensemble name of Tricotism was borrowed from the Oscar Pettiford composition of the same name Craig further amplified that it meant "Triple heart beat" and this was certainly the case as this superb trio played as one with a thoroughly entertaining 12 number set. Heavily influenced by Oscar Peterson Craig's set featured several Peterson compositions including "Sushi" and "Wheatland" from Oscar's Canadiana Suite. The first set closed with the Oscar Pettiford track that gave the trio their name but the highlight came in the second set when a ballad medley was introduced. This featured separate solos led by Nigel on "We�ll be together again" before Sandy took the helm for "Prelude to a kiss" before Craig brought the medley to a splendid finale with "I got it bad". The effortless ease with which the musicians appeared to play disguised the complexity of several of the numbers and demonstrated what superb musicians they are. The next concert will be on Sunday 22nd May when the club welcomes back Cass Casswell together with his Storyville Strutters and Sinead McCabe. Tickets can be ordered by 'phoning 730601 or Bill Wills on 523879.